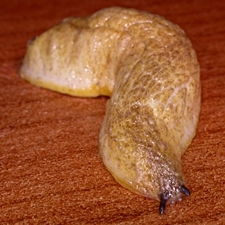 Shell slug (Testacella haliotidea, Testacellidae). Snails, whose way of life includes burrowing underground, might begin to reduce their cumbersome shell in their evolution and become slugs. Between snails with a complete shell and slugs without one there are numerous different grades of shell reduction, one of which are the so-called shell slugs or half-slugs – slugs with a tiny little rudimentary shell at the end of their tails, into which they cannot withdraw. One family of shell slugs are the Daudebardias (Daudebardiinae), a group in the Gastrodontoidea superfamily. Another is the Testacellidae. From their tiny little shell at the tail end two characteristic furrows trail towards the head. Testacellas are, however different from Daudebardias in their shell being so far reduced that it resembles a small shell of a sea-living ormer or abalone (Haliotidae). Pictures: Piergiorgio Di Pompeo (Source). Testacellids live mainly underground, on one hand to hunt their favourite prey, earthworms, on the other to hide from evaporation. They find their prey by their very well developed sense of smell. With dagger-like radula teeth pointing backwards, they manage to catch the earthworm and hold it, even if it tries to pull back into the surrounding earth. Testacellids do not have an upper jaw, like for example Helix pomatia, because they, usually eating their prey in whole, need not to cut pieces off: The prey is swallowed in whole and digested alive. 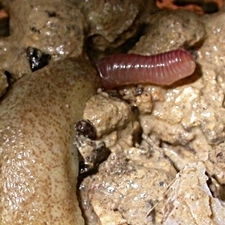 Testacellids are often found in gardens and agricultural areas, where earthworms are abundant. Testacella scutulum Sowerby 1821, the shield slug. 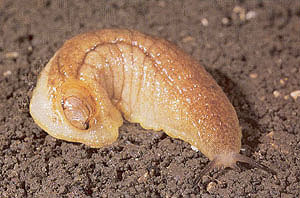 The species Testacella haliotidea is most widely distributed and may even be found in Western and South-western Germany. Conchological Society of Great Britain & Ireland: Identification aid: Testacella species.